In a recent op-ed in the Atlanta Journal-Constitution, former U.S. President Jimmy Carter called for the end of the death penalty. 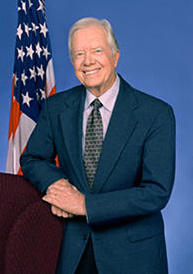 President Carter cited the risk of wrongful executions, the lack of evidence of deterrence, and the costs of prosecution as reasons to abolish capital punishment. He wrote, “[T]here has never been any evidence that the death penalty reduces capital crimes or that crimes increased when executions stopped. Tragic mistakes are prevalent. DNA testing and other factors have caused 138 death sentences to be reversed since I left the governor’s office. The cost for prosecuting executed criminals is astronomical. Since 1973, California has spent roughly $4 billion in capital cases leading to only 13 executions, amounting to about $307 million each.” President Carter also cited the unfair application of the death penalty as an especially compelling reason for repeal: “Perhaps the strongest argument against the death penalty is extreme bias against the poor, minorities or those with diminished mental capacity. Although homicide victims are six times more likely to be black rather than white, 77 percent of death penalty cases involve white victims. Also, it is hard to imagine a rich white person going to the death chamber after being defended by expensive lawyers. This demonstrates a higher value placed on the lives of white Americans.” Read full op-ed below. For many reasons, it is time for Georgia and other states to abolish the death penalty. A recent poll showed that 61 percent of Americans would choose a punishment other than the death penalty for murder. Also, just 1 percent of police chiefs think that expanding the death penalty would reduce violent crime. This change in public opinion is steadily restricting capital punishment, both in state legislatures and in the federal courts. As Georgia’s chief executive, I competed with other governors to reduce our prison populations. We classified all new inmates to prepare them for a productive time in prison, followed by carefully monitored early-release and work-release programs. We recruited volunteers from service clubs who acted as probation officers and “adopted” one prospective parolee for whom they found a job when parole was granted. At that time, in the 1970s, only one in 1,000 Americans was in prison. Our nation’s focus is now on punishment, not rehabilitation. Although violent crimes have not increased, the United States has the highest incarceration rate in the world, with more than 7.43 per 1,000 adults imprisoned at the end of 2010. Our country is almost alone in our fascination with the death penalty. Ninety percent of all executions are carried out in China, Iran, Saudi Arabia and the United States. One argument for the death penalty is that it is a strong deterrent to murder and other violent crimes. In fact, evidence shows just the opposite. The homicide rate is at least five times greater in the United States than in any Western European country, all without the death penalty. Southern states carry out more than 80 percent of the executions but have a higher murder rate than any other region. Texas has by far the most executions, but its homicide rate is twice that of Wisconsin, the first state to abolish the death penalty. Look at similar adjacent states: There are more capital crimes in South Dakota, Connecticut and Virginia (with death sentences) than neighboring North Dakota, Massachusetts and West Virginia (without death penalties). Furthermore, there has never been any evidence that the death penalty reduces capital crimes or that crimes increased when executions stopped. Tragic mistakes are prevalent. DNA testing and other factors have caused 138 death sentences to be reversed since I left the governor’s office. The cost for prosecuting executed criminals is astronomical. Since 1973, California has spent roughly $4 billion in capital cases leading to only 13 executions, amounting to about $307 million each. Some devout Christians are among the most fervent advocates of the death penalty, contradicting Jesus Christ and misinterpreting Holy Scriptures and numerous examples of mercy. We remember God’s forgiveness of Cain, who killed Abel, and the adulterer King David, who had Bathsheba’s husband killed. Jesus forgave an adulterous woman sentenced to be stoned to death and explained away the “eye for an eye” scripture. There is a stark difference between Protestant and Catholic believers. Many Protestant leaders are in the forefront of demanding ultimate punishment. Official Catholic policy condemns the death penalty. Perhaps the strongest argument against the death penalty is extreme bias against the poor, minorities or those with diminished mental capacity. Although homicide victims are six times more likely to be black rather than white, 77 percent of death penalty cases involve white victims. Also, it is hard to imagine a rich white person going to the death chamber after being defended by expensive lawyers. This demonstrates a higher value placed on the lives of white Americans. It is clear that there are overwhelming ethical, financial, and religious reasons to abolish the death penalty. Jimmy Carter was the 39th president and is founder of The Carter Center in Atlanta. (J. Carter, "Show death penalty the door," Atlanta Journal-Constitution, April 25, 2012). Read more New Voices on the death penalty. Listen to DPIC's podcast on Deterrence.